For my second round of dyeing I wanted some softer, less-saturated colors. As you can see from the picture, it didn’t work. 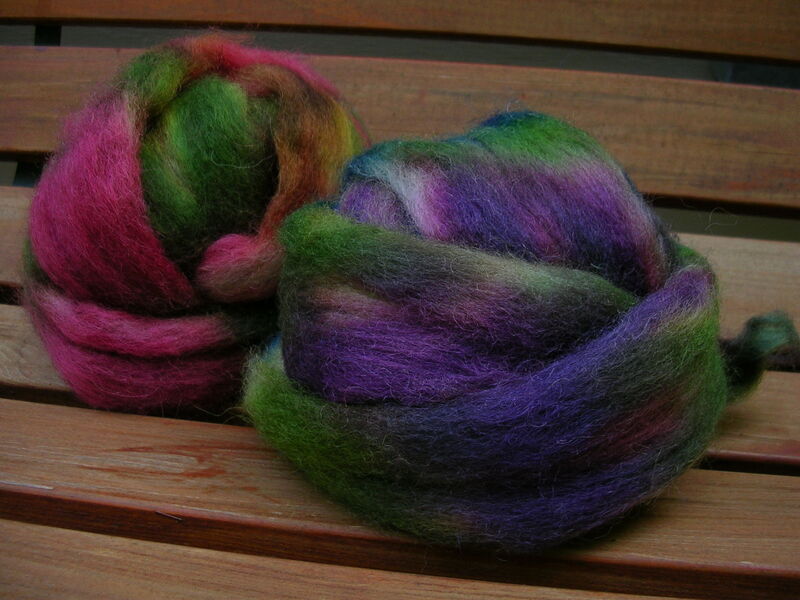 These two batches of roving were supposed to be softer, grayer colors. Why didn’t it behave? Ah well. That just means I’ll get to try again later. More fiber to play with! If anyone is interested in replicating these colorways, here is how I made them. I started with three Jacquard Acid Dyes. Crimson (619), which that site doesn’t have, Gold Ochre (636), and Sapphire Blue (622). You dump the 1/2 ounce container of dye into a glass jar, then add 1 cup of hot water. This gives you the base for mixing and diluting as much as you want, and you can screw a lid on it and store it for a long time. When you want to use it again, just take off the lid, pop it in the microwave to heat up, and you’ve got it! (I nuked mine for one minute each.) Note: I just found out that the dye directions say to heat them up on the stove. I don’t know whether the microwave did any damage or not. 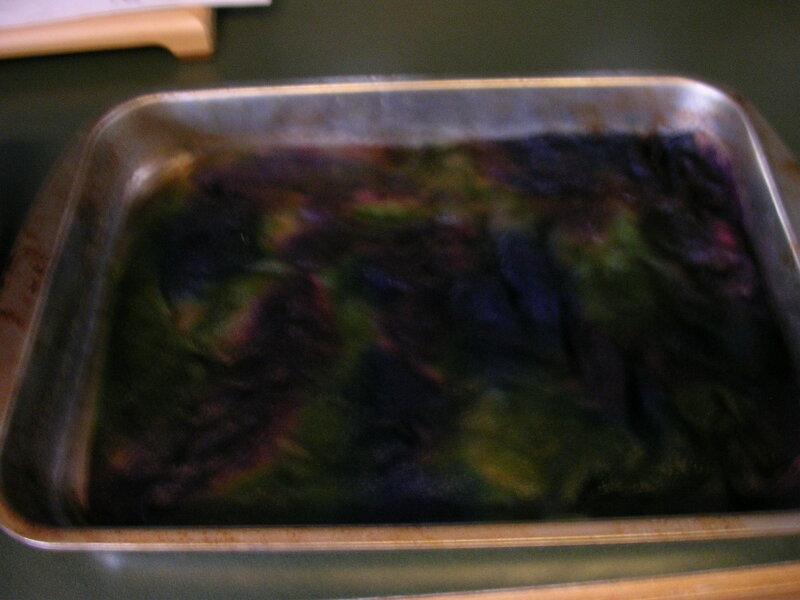 The method I used is oven dyeing. You can find the tutorial here. Oh, and for the record, 150 degrees Celsius is 302 degrees Fahrenheit. I just used 300 degrees. Read the tutorial before you read the stuff below. It’ll make more sense. 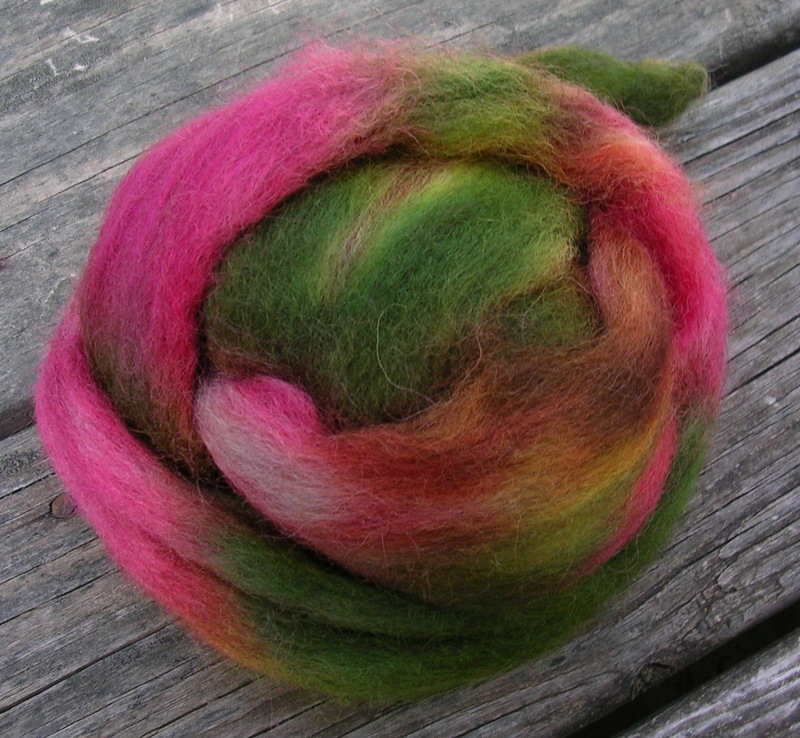 For the Green/Pink colorway: 1 and a 1/2 ounces of light gray roving. Soaked for 45 minutes, with a quarter sized squirt of Dawn. I drained out most of the water, but left enough so I could see it around the edges. Take two plastic cups and a couple plastic straws for stirring and “measuring.” I would stick a straw into the dye up to about two inches, then press my finger over the top to suction the liquid in, and release it into the mixing cups. Pink: Two parts red and a tiny, tiny touch of blue. Like a half drop. Add a 1/2 cup of hot water and the other 1/3 of the quarter cup of vinegar. 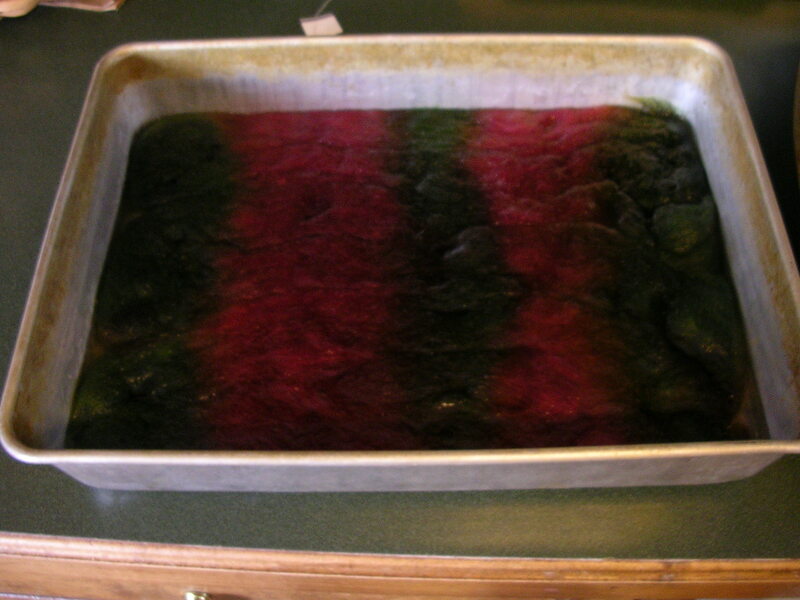 This dye looked really red until it came out of the oven, when it went more fuchsia. I poured my dye on in stripes across the roving. The pink turned out much more intense than I planned. Next time I’ll try adding even more water. Or maybe it was the amount of vinegar I used. Too many variables! 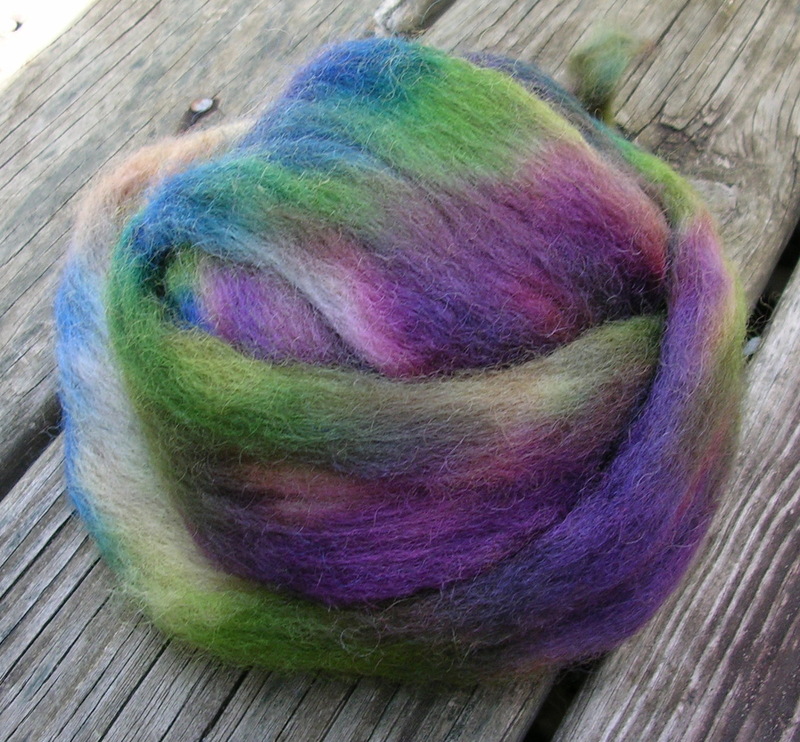 Here is what the roving looked like after baking, while it was still wet. The colors lightened up once it dried. At this stage it reminds me of a watermelon. A far cry from a thistle, but it’s still pretty. I’ve started spinning it, and the pink goes a little rusty wherever it gets wrapped with the green. It’s actually a little more “thistly” in single form than in roving form. Something good to keep in mind is that some colors may darken a bit when you spin them. Use 3 cups for this, and you’ll need straws again. Purple: Two and a half red to one blue. Add the same amount of hot water as for the green, and the same amount of vinegar. As a side-note, the purple did something rather strange, and I’m not sure why. The red bled out from the sides of the purple, so I have a purple chunk with pinky red splotches to either side. Maybe I didn’t use enough vinegar to set the red. Blue: Two blue. Fill with hot water to a 1/4 cup. Add 1 teaspoon of vinegar. And here is the still wet roving. I had some trouble with patches of roving not getting dyed on these. There has to be some way to help prevent that. Maybe if I make sure the dye flows down into the bottom of the pan . . . although I’ve heard that you want to be careful not to make a sort of brownish sludge color all across the bottom of your roving. Ooh, very cool. Even if they didn’t turn out exactly as you wanted, I think they’re both pretty! a shameless effort to bribe you all into a Texas visit. This spinning/weaving store is about a 45 minute drive from us and I am dying to check it out! Hey, if it were up to me I’d be on the next plane out there! 🙂 That looks like a really fun store.